The compound is designed for revitalization – repair, restoration, antiwear protection and increase of service life of power steering booster and other hydraulic equipment parts, improvement of lubricating properties of hydraulic fluid. Special two-component formula of the compound allows to achieve the effect of simultaneous restoration of worn-out parts, their protection against wear and enhancement of lubricating properties of hydraulic fluid. 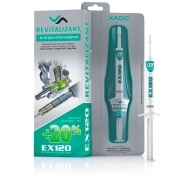 Introduce the content of the syringe* into the fluid, which is warmed up to the operating temperature, in the tank of a power steering booster. Start the engine and provide its idle operation during 2-3 minutes. Then turn the steering wheel during 5 minutes with the engine turned on. Drive a car as you normally do. The treatment is considered complete after the mechanism has been in operation for 50 hours or after 950 miles of run. *1. The temperature of the compound before application should not be lower than +20…+25 0C. 2. It is recommended to preliminary dissolve the content of the syringe in a small amount (about 50ml) of used hydraulic fluid. 3. If the fluid in the tank of a power steering pump is contaminated (opaque or changed its initial color etc.) it’s recommended to change hydraulic fluid before application. 30 ml of the product is enough for hydraulic system with capacity of 3-5 l. If hydraulic fluid exceeds 5 liters dosage should be increased at the rate of 30 ml for every 5 l of oil.